If you favor the bird of prey, display your bowie as a nice addition to your home or office. Put this mantle on a wall as a tribute to your country. 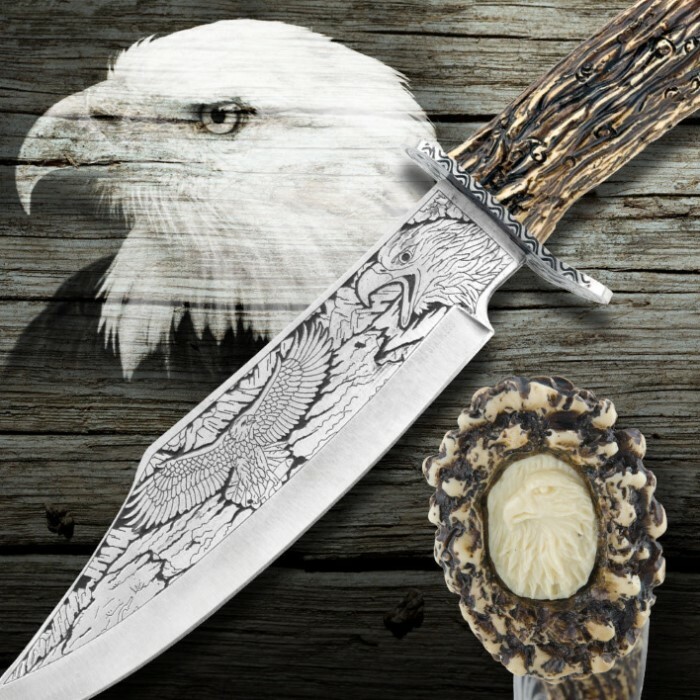 Bowie knife is 8 3/4" overall with a 5 1/3" stainless steel blade that is adorned with illustrative etchings of wildlife scenery. The display is made of a brown resin and is modeled after stag antlers. This is a beautiful piece worthy of display in any living room or "Man Cave". I have purchased two of them, one for a gift. This is a fantastic center piece for any collection! I bought this as a gift to my younger brother who has begun a small collection of bald eagle statuettes and other bald eagle themed items. This is now the grand center piece of his collection. Know that this blade is massive. The blade itself is over a foot long and the handle about 8". All of the antler decor is faux but is realistic enough to fool some people at a distance. The blade is also unsharpend upon arrival but has a fantastic sheen. I like it alot! It will look real nice on display shelf. I wouldn't want to take the knife to the field, but it's a real looker. 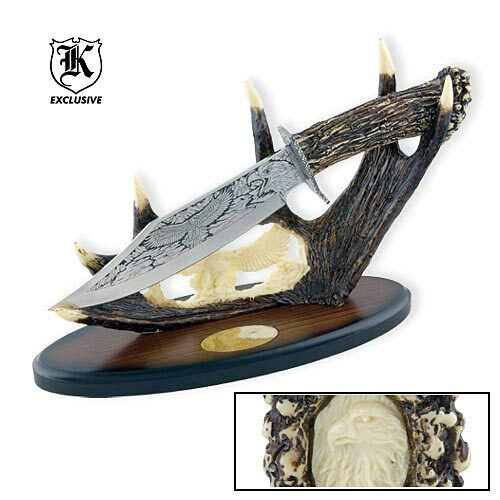 If you collect knives this is a good one to have in tour collection. I collect eagle knives and it fits in real well. Buy it! The thing I have liked was a sheath to go wit it, but otherwise great! I made my first order and this one was the best out of them. It has very nice engravings on the blade and the handle looks realy nice. the stand i thought would be a little better but its still a realy good buy.